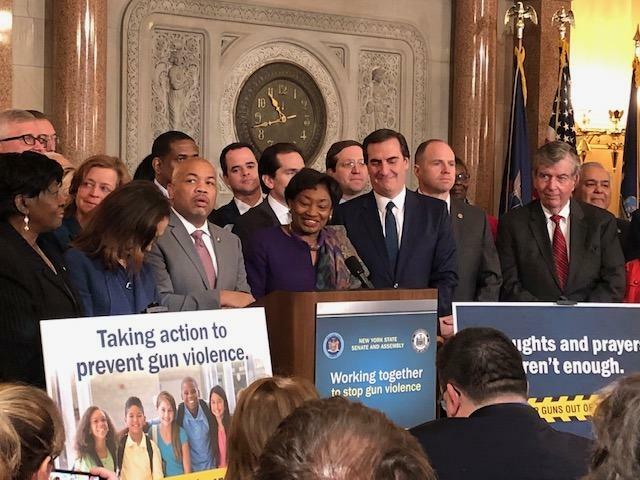 Assembly Speaker Carl Heastie and Senate Leader Andrea Stewart-Cousins hold a news conference prior to voting on several gun control measures at the Capitol on Tuesday. The New York State Legislature built on the state’s 2013 gun control laws Tuesday, passing measures to extend the waiting period for background checks for some purchasers and to forbid teachers from bringing guns to school. At a news conference before the measures were voted on, Senate Leader Andrea Stewart-Cousins said there have been 27 mass shootings in the U.S. already in 2019. “Every day, it seems, we wake up to the headlines of another mass shooting, another horrific gun crime,” Stewart-Cousins said. Assembly Speaker Carl Heastie said “thoughts and prayers” are not enough. He said the bills will permit judges to issue an “extreme risk protection order” to authorize police to temporarily remove guns from a household if a person in the home is deemed by a school official or law enforcement to be a potential danger to themselves or others. “And keep a person who is a threat to themselves or others from possessing a gun for up to one year,” Heastie said. Another measure extends the waiting period for background checks for gun purchasers for up to 30 days. Stewart-Cousins said the background checks of 91 percent of gun purchasers take only a few minutes, but for about 9 percent, there are questions raised. Under the current law, those purchasers are often sold the guns anyway. The legislation further restricts bump stocks, the devices used to turn semiautomatic weapons into machine guns and used in the 2017 Las Vegas shooting where 58 people were killed. The use of bump stocks are already forbidden; now the sale and possession of the devices will be banned. Another measure prohibits teachers from being asked by school administrators to bring guns to school to protect the students. Among those who support that measure are the parents of Scott Beigel, one of the victims in the Parkland, Florida, school shooting. Beigel, a Long Island native who was a geography teacher and cross country coach at the Marjory Stoneman Douglas High School, died saving his students from a mass shooter on Feb. 14, 2018. His mother, Linda Beigel Schulman, said her son never would have wanted to have to bring a weapon to his classroom. In the Senate, Republican senators objected to the ban on teachers carrying weapons. Sen. Andrew Lanza said the bill restricts local control of schools, and the Second Amendment rights of New Yorkers. And he called the bill a “red herring” that won’t keep schoolchildren safe. The bill does continue to permit school safety officers to carry guns. Nearly all of the 23 GOP senators voted against many of the gun control measures, although 10 Republican senators did vote in favor of a measure to aid gun buy-back programs. Gov. Andrew Cuomo, who championed the 2013 gun control laws known as the SAFE Act, and convinced the then-Republican-led state Senate to pass it, met with victims of gun violence before the vote. Cuomo appealed to opponents of the bills, saying the measures don’t impinge on the Second Amendment. Cuomo has promised to sign the bills. Legislative leaders say they are still vetting more gun control legislation. The bills include including a ban on guns manufactured by 3-D printers, and a law that requires guns to be stored in a secure location. “This is not an every-six-year exercise,” Stewart-Cousins said.